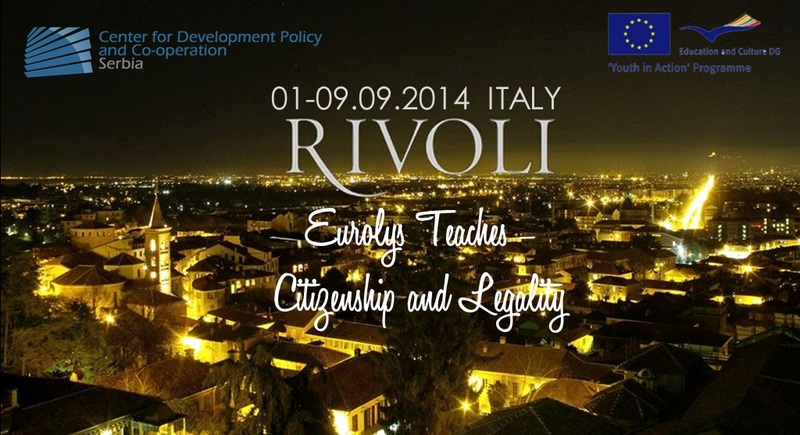 Centar za razvojnu politiku i saradnju (CRPS) ima zadovoljstvo da vas pozove da se prijavite na konkurs za omladinsku razmenu “ Eurolys Teaches – Citizenship and Legality” koji će se održati u Rivoliu, (Italija) od 1- 9 septembra 2014. godine. Pravo prijavljivanja i učešća imaju svi mladi iz Srbije starosti od 18 do 25 godina. Prijavljivanje se vrši popunjavanjem aplikacione forme (ispod), za više informacija pišite na mail konkurs@crps.org.rs sa nazivom mail-a “za Rivoli” ili pozovite 063/8329542, 061/1695692 od 12 do 16 časova. Organizator snosi troškove smeštaja i hrane. Učesnicima će biti refundirano do 170 evra troškova puta. Planiran je organizovan autobuski prevoz iz Beograda do Milana,i Rivolia. is an international Youth Exchange of experience, knowledge and discussion, aimed at young people from Italy, Germany, Poland, Romania, Spain, Serbia and Turkey. A total of 43 young people and Youth Leaders, with the guidance of animators. Participants: aged between 18 and 25 years. Program: lots of art activities, video, educational and recreational activities. Themes: We will discuss about Citizenship, Corruption, Legality and much more, through games, visits and workshops. The experience is an opportunity to open a window on the world and to stimulate an open-minded vision of the world, against prejudices and clichés, to recognize the equal dignity of cultures despite their diversity and in order to feel even more Europeans. But most of all … to meet new friends!